LOGAN SQUARE — Sub-freezing temperatures can't keep pie lovers down — especially when it's the day before Thanksgiving. Starting at 7 a.m. Wednesday, customers lined up at the Bang Bang Pie Shop, 2051 N. California Ave., waiting about 30 minutes to pick up their (mostly) pre-ordered holiday pies. Still, owner Dave Miller said there were still plenty of people walking in last minute in hopes of snagging a chocolate pecan, apple crumble, key lime or roasted pumpkin pie. "There are still so many people calling that didn't even think about it until today," he said. 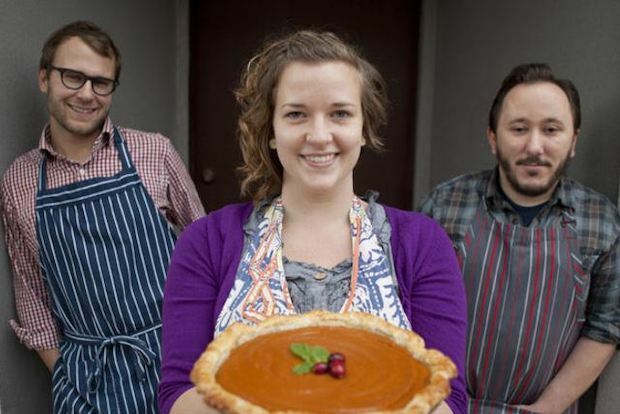 This is the popular pie shop's second Thanksgiving, so the bakers were able to plan for the chaos, creating a system involving online pre-orders, tickets and a separate payment and pick-up spot. "It's a little more organized this year, and I think people are happier," Miller said. The three-point system (check-in, payment, pick-up) also allowed for more chatting with the customers, who often have questions about how to refrigerate and re-heat the pies and other general pie facts. "Last year we felt like we were just bombarded and didn't really have a chance to talk to the customers," Miller said. "So we created three points to talk to them. We want to be able to be like that even on the busiest day of the year." Miller said he expected to sell about double the 1,500 to 2,000 pies they sold last year, and anticipated still falling short Wednesday. To further ease customer waiting, coffee was available for purchase outside, as was Bang Bang's biscuit menu. Bang Bang borrowed the Hoof and Feather food truck to sling their regular menu. As of about 10:30 a.m., Miller said he thought Bang Bang would likely sell out by closing time at 2 p.m., though there was the possibility of cancelations. As for those already thinking ahead to Christmas, Miller said online ordering will open on Thursday. "We strongly, strongly encourage people to pre-order for Christmas," he said.